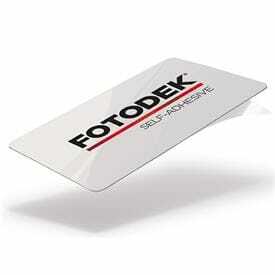 FOTODEK ID cards come in many different forms. 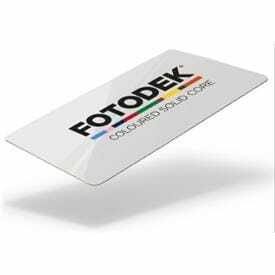 The huge spectrum of products available from stock include our flagship FOTODEK® Premium white blanks, a wide range of hi-tech contact & contactless chip cards, key fob cards, coloured cards with options of white or solid colour core and bio degradable cards to name but a few. The range is renown for its consistent quality, and is widely recognised as the market leading brand. An innovative and constantly expanding range of products gives you more choice than ever before for your blank card requirements. To add extras to any of the FOTODEK cards suffix existing code as below. Combinations of suffix codes may be used when multiple options are required. Please note MOQs may apply to some options. With FOTODEK® you get optimum quality images and enhanced printer performance. 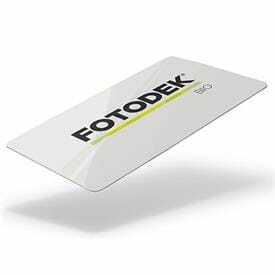 All cards are manufactured to ISO standards. Card surfaces are clean and scratch and burr free. Polyester core increases durability from 2500 to 25000 flex cycles.